Not sure if you take these guys for a daily walk at lunch, but the meat was the most evenly marbled that I have seen in years. Because of that, it seasons the meat when cooked and disappears. Incredible." On another note, those steaks were great. Need a price sheet for purchase. Is there a break for halves or quarters?" 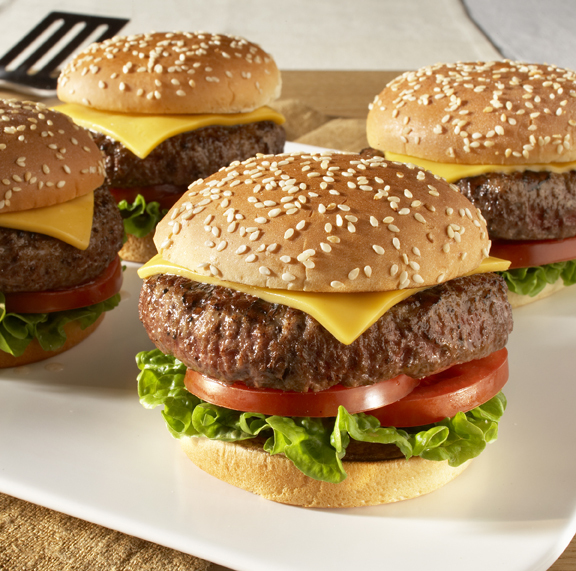 Burgers On the Grill - Mix together Ben's Grass Fed ground beef, chopped onion, salt & pepper, Worcestershire sauce and any other seasonings that you like. Heat your coals or gas grill and grease the grill. Cook burgers 5 minutes per side. You can add a slice of cheese for the last two minutes of cooking. Meat Balls - Each pound of meat makes about 25-36 meatballs, depending on size. These freeze well, so make a lot! In a large bowl, beat eggs. Add all remaining ingredients. Mix well with hands. Shape into 1-inch balls. Place meatballs in single layers on ungreased cookie sheets. Bake at 400 degrees for 10-15 minutes, until cooked throughout. Serve with spaghetti and your favorite sauce. Preheat oven to 350°F. Combine ground beef, bread crumbs, onion,milk, egg, salt and pepper in large bowl, mixing lightly but thoroughly. Shape beef mixture into 10 x 4-inch loaf on rack in broiler pan. Bake in 350ºF oven 1-1/4 to 1-1/2 hours, until instant-read thermometer inserted into center registers 160°F.